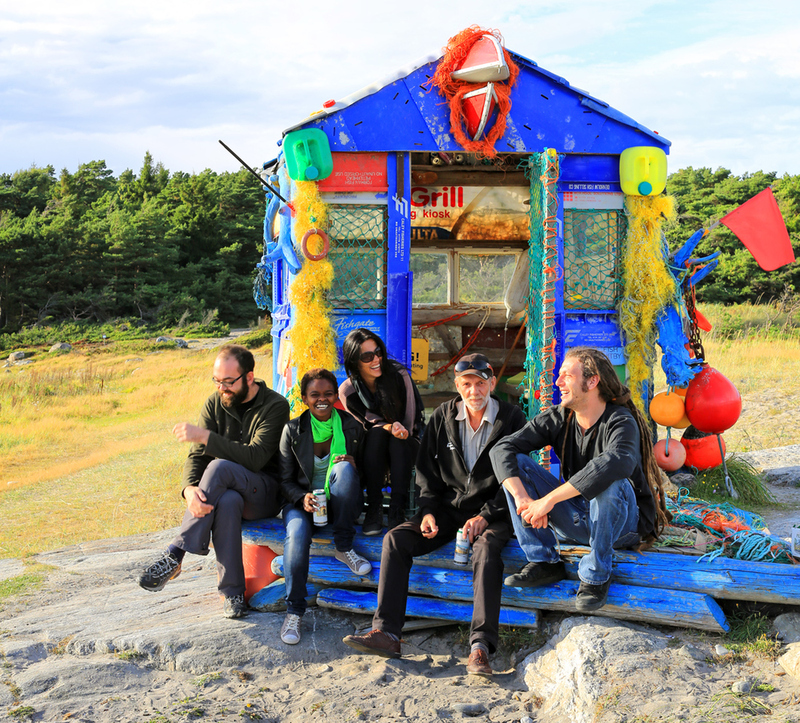 Since fall of 2013, this colorful beach house on Storesand has been open to visitors. The look of the house makes you think of a wonderful paradise island in the Pacific, but there are much more serious topics that it is trying to convey. “Ocean Hope” is a cabin built from plastic found in the ocean in an attempt to raise awareness that plastic doesn’t disappear. 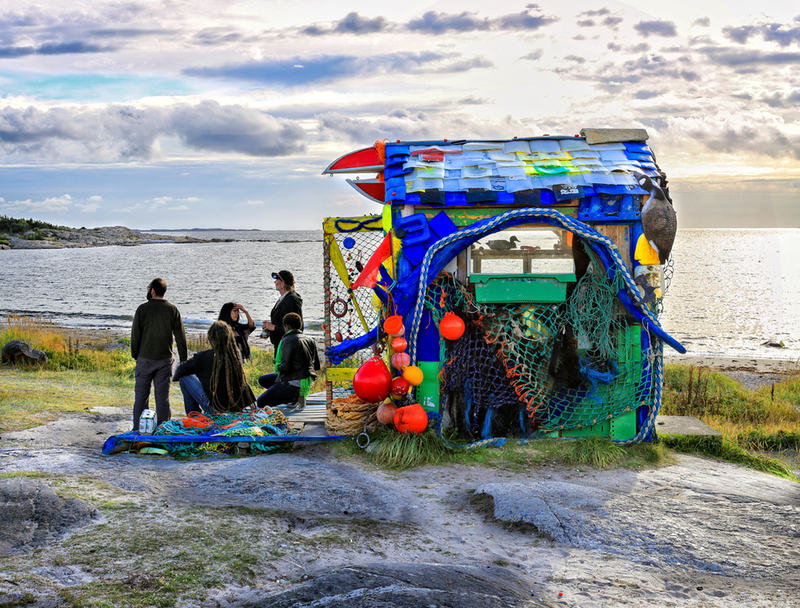 Storesand is a part of Outer Hvaler National Park and in many ways the cabin “Ocean Hope” shows the theme behind the creation of the national park. Outer Hvaler National Park is the country's first national underwater protection of the underwater values and the protection of the eco-system of the associated coastal stretch. In addition to the floating garbage in the world's oceans that damages the environment, there are many animals that suffer the trash. Vast amounts of garbage are now threatening to exterminate birds and mammals. And worst of all is plastic. Unfortunately it is true that there are large quantities of floating plastic garbage in the world's oceans. There are millions of tons of garbage into the sea every year. A UN report from 2009 estimates 6.4 million tons annually - more than 17,000 tons every single day. Other estimates are almost twice that. The ecological consequences of litter in oceans are severe. Animals and birds that live along the beaches are caught and die in rope and netting leftovers. They can also die after having eaten plastic pieces floating in the sea. Because the plastic remains in the stomach of birds, the plastic intake means that the stomach fills up so much that the birds cannot eat anymore. Birds are often an indicator of environmental conditions in the ocean. The fulmars of the North Sea are one of the seabird species most affected by plastic pollution. It is believed that fulmars mistake plastic particles with food, since the shape of the particles are similar to their natural prey. Since the campaign "Save the North Sea" started in 2004, fulmars have been used as an indicator of marine pollution. In the North Sea, it is estimated that 95 percent of fulmars have plastic in their stomachs. It is also estimated that on average there are 26 plastic particles in birds, which amounts to 0.28 grams of plastic per bird. In a survey of fulmars from Svalbard dating back to 1984, they found plastic in the stomachs of 30 percent of the birds. Another problem is that the plastic breaks down into micro-particles which are eaten up by animals and pass through various food chains, which can be transferred from plankton to fish. Thus, the toxins move up the chain, and the animals and people who eat fish. Plastic contains a variety of organic contaminants such as PCBs, PAHs, pesticides, phthalates, brominated flame retardants and bisphenol A, and studies show that these pollutants can be transferred from plastics to marine organisms. The pollution of the oceans is a growing global phenomenon, with unimaginable dimensions, and is an alarming and frightening challenge we face. It's no longer the case that the question is whether we can prevent the oceans from becoming polluted - the sea and the wildlife are already damaged and soured by toxins and plastics, forever, or at best for a few hundred years into the future. The question now is whether we can start with ourselves and look at the consequences of today's lifestyle on both the local and global eco-system. Politically correct or not, it's just a dramatic change in an individual’s life, transport, and fishing in the ocean that can prevent further pollution and destruction of oceans, coastal areas and wildlife watchers. Unfortunately, the future looks bleak, simply because it would require too much from us - not because it is not feasible, but that there is not enough will and sufficient collective push for change. Technological development can be a faint hope that the eco-systems in the oceans can be improved and protected against future pollution. Although this is a global problem and the Outer Oslofjord has so far been spared the worst natural disasters, there is reason to remember the Godafoss accident which happened between Asmaløy and Kirkøy at Hvaler in 2011. Despite the fact that it killed about 2500 birds because of the ship's oil spill after hitting ground, you have to be able to characterize the incident as small in relation to the major natural disaster it could have been for the vulnerable Hvaler archipelago and Outer Oslofjord / Skagerrak. Artist Solveig Egeland and Project Ocean Hope spearheaded the construction in cooperation with, among others, the Children's Environmental Agents, Coastal Service, Outer Hvaler National Park, Outer Hvaler National Park Center, Norwegian Nature Inspectorate (SNO) and the Interreg project Land meets the Sea, Oslo Fjord Open Air, and Hvaler municipality as well as the municipality of Fredrikstad. The cabin remains on Storesand until autumn before being installed at the science center INSPIRIA science center in Sarpsborg.